October 19 is the third annual Global Ethics Day, a good opportunity to hold an event exploring the role of ethics in international affairs. In the tradition of a "teach-in" model, these events will be run by each institution as it sees fit while being part of a worldwide Global Ethics Day. Although it's only a couple of years old, Global Ethics Day is gaining momentum every year We hope you'll join us in 2016 and host an event on whatever aspect of global ethics concerns you most. 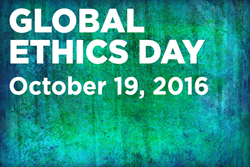 Carnegie Council for Ethics in International Affairs announces its third annual Global Ethics Day (#globalethicsday2016) on October 19, 2016. Inspired by Earth Day, Global Ethics Day provides an opportunity for organizations around the world to hold events exploring the meaning of ethics in international affairs. Carnegie Council encourages academic institutions everywhere to use this day to hold programs focusing on ethics, such as lectures, film screenings, debates, or panel discussions. All ideas welcome. In the tradition of a "teach-in" model, these events will be run by each institution as it sees fit while being part of a worldwide Global Ethics Day. Carnegie Council will promote Global Ethics Day activities on its online community platform http://www.globalethicsnetwork.org and share any resources that are created. Course and lecture ideas can be found on Carnegie Council's website here. Sixty-eight institutions worldwide participated last year. To see the list, click here. Here are just a few examples of events in 2015: Carnegie Council co-hosted an event on Feeding the Planet; Texas Tech University (TTU) Ethics Center held a filibuster on legal, environmental and migration ethics; and globalethics.net chose responsible leadership as its main theme. "Although it's only a couple of years old, Global Ethics Day is gaining momentum every year," says Carnegie Council Senior Fellow Devin Stewart. "We hope you'll join us in 2016 and host an event on whatever aspect of global ethics concerns you most. Carnegie Council's slogan is 'Ethics Matter.' Help us make this a reality." To add an organization's name to the list of Global Ethics Day participants for 2016, please contact Alex Woodson at: awoodson(at)cceia(dot)org.